It's been discussed and I've done some pretty extensive coverage on the Verizon 4G LTE Louisville rollout. Now that we have blazing fast 4G LTE speeds within the Louisville area, many are still scratching their heads, saying, but where? 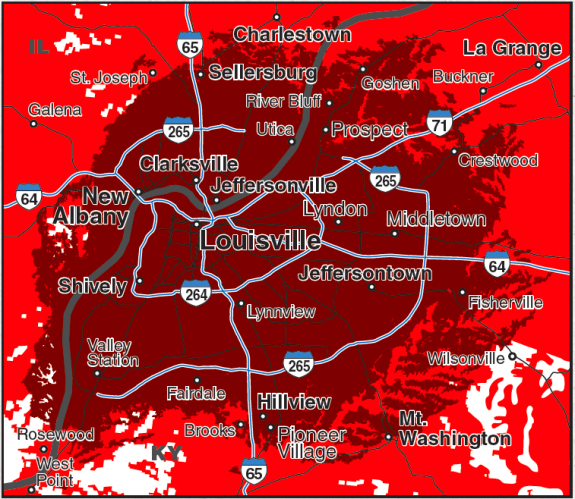 You'll see a brief screenshot above of the latest coverage areas for Louisville's 4G LTE coverage. The dark areas indicate 4G coverage while the lighter red indicates 3G coverage (white indicating coverage not available). You can view a larger version of the map here.